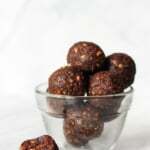 So what happens when a bunch of my favorite superfoods, healthy nuts, dates and cocoa powder come together? 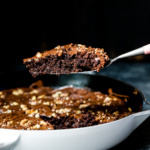 Magical NO BAKE FUDGY CHOCOLATE ENERGY BITES that taste exactly like brownies! and dark chocolate on top with a little sea salt. They’re impossible not to love yet healthy enough to enjoy for an afternoon snack. I love having them on hand for a healthier, nutritious dessert. I swear to you, everyone who tries these LOVES them! If you make these, be sure to leave a comment below and rate the recipe. And if you’re on Instagram, you can give me a follow here and tag #ambitouskitchen with the recipes you make from my site! 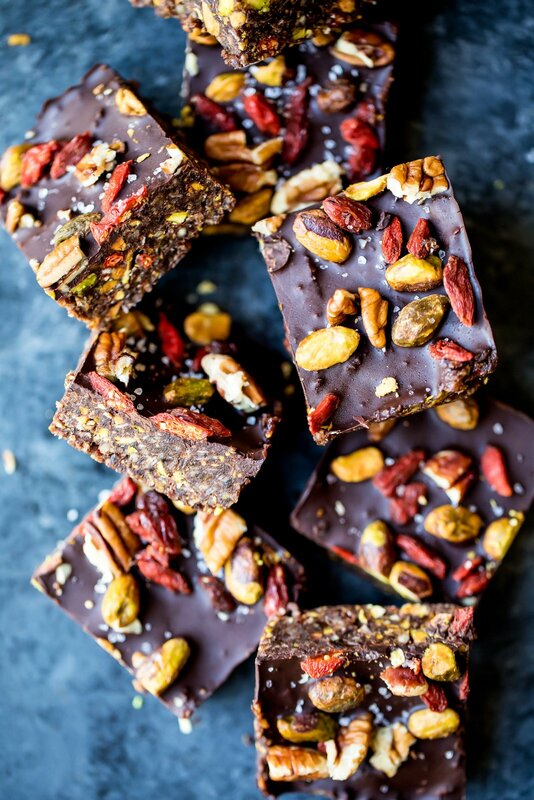 No bake superfood brownie energy bars packed with pistachios, pecans, walnuts, chia seeds, coconut and dried fruit! 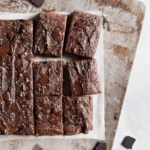 Topped with dark chocolate and sea salt. 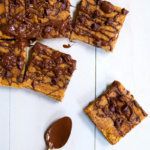 The perfect nutritious healthy dessert! Add dates, walnuts, pecans, only ¼ cup of pistachios to the bowl of a food processor. Process until chunky. Next add in unsweetened shredded coconut, chia seeds, cocoa powder, coconut oil and vanilla extract. Process again until mixture is chunky and slightly clumping. If mixture is dry, add 1-2 tablespoons of warm water. Next add in remaining ¼ cup pistachios and goji berries and pulse again a few times until pistachios are slightly chunky. Add mixture into a 8x4 inch loaf pan lined with parchment paper, pressing evenly towards the sides of the pan. Add dark chocolate to a small saucepan and place over low heat until melted. You can also microwave in 30 second increments, stirring in between until chocolate is fully melted and smooth. Pour over the bars, tilting pan so that the chocolate covers the bars evenly. 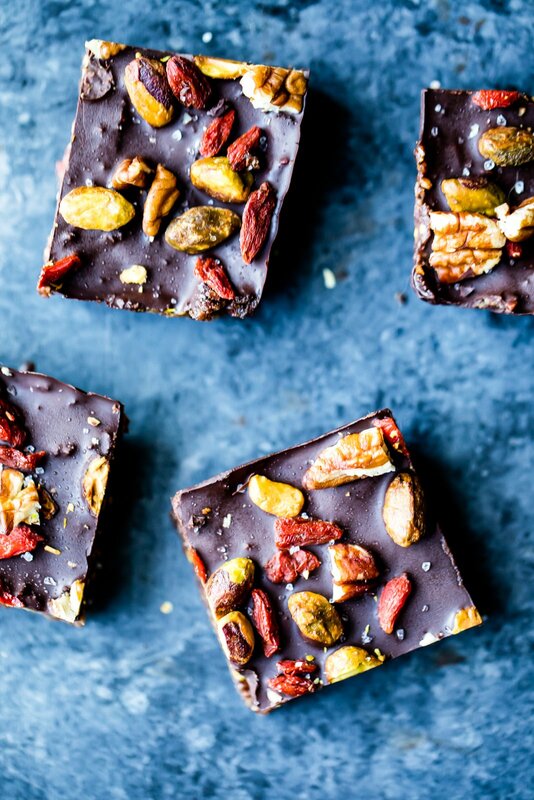 Garnish the bars with 1 tablespoon of the following: pistachios, goji berries and crushed pecans. Place bars in the freezer for 30 minutes-1 hour to harden. Once ready to serve, sprinkle with Maldon sea salt then cut into 8 squares. Store safely covered in the freezer for up to 1 month. Enjoy! If you want you can keep the melted dark chocolate off the top. They are still incredibly delicious! 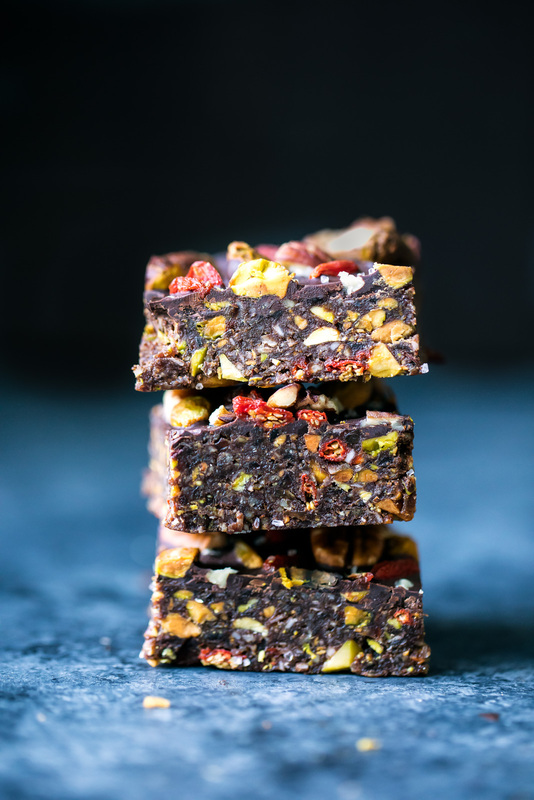 64 Responses to "No Bake Superfood Brownie Energy Bars + video"
I’d like to try this as it sounds delicious but can’t seem to find your print button anywhere. I am looking forward to trying these. In the Notes, is the word “of” supposed to be “off” (meaning, I presume, that the chocolate topping is optional)? I just tried this recipe yesterday and can I say – they were just divine. I did a double batch and also made more than 16 portions as I cut them half the size of yours. They are to die for. I will be making this recipe again for sure. They are so good that I think they will remain in my fridge…..I dont think I will buy chocolate again with all the goodness in these ones. Hi Anna! I’m so glad you enjoyed these 🙂 the perfect, chocolate-y treat to keep in the fridge! I made these tonight. I used dried cherries instead of goji berries. Oh My Goodness! These are so good! I will definitely make them again. (And FYI, I had never in my life eaten a date before today.) Thanks for a great recipe! Hello lovely! This seems amazing! I’m looking to be on top of Christmas prep, and want some things done early. How long would this keep in the fridge you reckon, or is it even freezable? Thanks very much! Hi! You can freeze these up to a month 🙂 Enjoy! How long to keep in fridge? And can you eat them straight from the Freezer? Please could you convert this into grams please ? Just use a converter app on your phone or computer! What could I substitute for the coconut? These were amazing! I didn’t use the coconut flakes as I didn’t have any at hand. 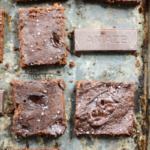 I’ve tried so many healthified versions of brownies and these are by far the best! Thank you for sharing!!! So great to hear!! These are one of my absolute favorites. I absolutely loved making these and they were delicious!!! Thank u for all your delicious recipes!!! Hi Patricia! All of the nutrition info is listed next to the ingredients 🙂 There are 234 calories per serving in this recipe. These are setting in the fridge as I type, but just by licking the bowl I know they are going to taste great! I used dried dates and soaked them for about 4 minutes in boiling water. A little more cost effective as I have 3 hungry boys and a hubby that will devour these in seconds! Thank you! I’ll be making these again! These are amazing Monique!! Thank you for all your amazing recipes. 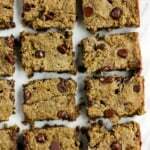 You are definitely one of my favourite go-to’s for healthy breakfast bars and snacks! I made this bar and it’s delicious. But just one thing I like ask you, does your bar crumbly? Because mine is. Did I do something wrong? Thank you for the tips. Hi! I’m glad you’re enjoying this one! I would be sure to press the ingredients so that they’re packed nice and tight – they should be too crumbly! Make sure you’re using fresh Medjool dates, not Deglet Noor dates that have been sitting in the bulk bin for who knows how long. Can I leave out the dates or is that what holds it all together? They look so amazing! You could try another oil or even butter, just know that the flavor might change a bit! Really tasty! I didn’t have pistachios so I used almonds. I had packaged dates that were a bit dry so I soaked them in boiling water for 15 min. The vanilla was a bit overpowering, so next time I will use half. We almost devoured all of them. That sounds perfect! I’m so glad you all enjoyed. Monique what do you think about an addition of 1/4 cup chopped spinach to the base? Hi Joyce! I’m not 100% sure – it might add a bit of an odd texture, but let me know if you try it! I loved this recipe so much. So yummy! 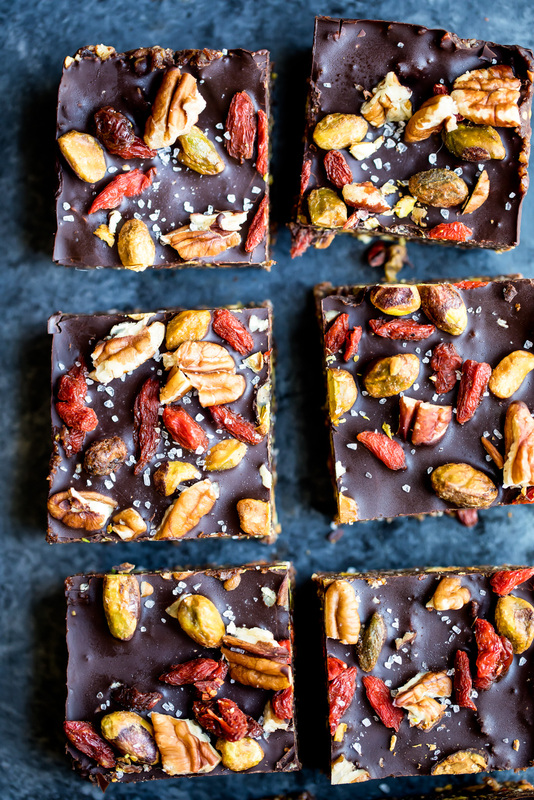 I was wondering if it was possible to post your recipe on my site with all credit to you (The Ambitious Kitchen’s No Bake Superfood Dark Chocolate Brownie Energy Bars) with a link back to this page? Hope you can let me know. Hi Amanda! So glad you enjoyed this one. Feel free to share the link to this recipe on your page, but please don’t post the full recipe. Thank you! I subbed dried dates (soaked in boiling water) and pumpkin seeds for the nuts due to nut allergies in our family and the recipe was very forgiving. Turned out wonderful. Love the texture and my kids devoured this healthy snack after school. Thank you. I’m a new follower of your blog and love the beautiful photos and inspirational recipes. Perfect! Welcome to AK, Sue 🙂 Hope you find some new recipes that you love. these ended up being the most expensive snack I ever made. I’m not independently wealthy, so I won’t be making these again. The ingredients are very expensive, then the nuts broke a hole straight through my Ninja food processor. I love the ingredients, but I’d much rather just have them separately or in salads or other ways. It helps to buy these ingredients in bulk, and then you can get a bunch of different uses out of them. I’m surprised to hear that the nuts broke through your food processor – so strange! Where do you buy Goji berries? I usually get them in the bulk section at Whole Foods. I made these today for a treat. Pure DECADENCE !!! My friends came over and we popped open a bottle of red wine..talk about pairing heaven!!! I made these yesterday as a,treat. My girlfriends stopped by and I served them paired with red wine.PURE DECADENCE! amazing! I made these on Sunday and love them so much! My boyfriend loves them too. Will definitely be making these again.